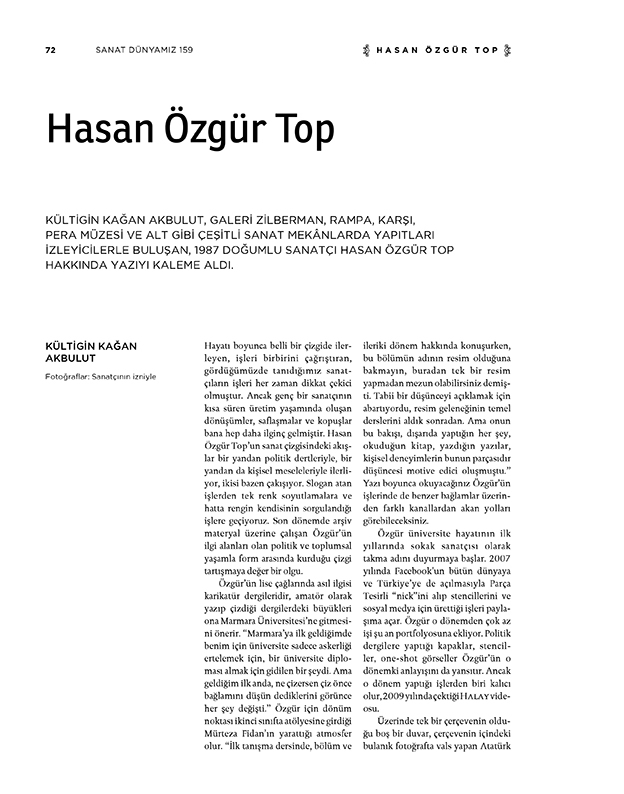 Kültigin Kağan Akbulut, artist born in 1987 whose artworks meet the audience in various art spaces such as Zilberman Gallery, Rampa, Karşı, Pera Museum and Alt, wrote about Hasan Özgür Top. Works of some artists, who move along a certain line throughout their lives, have art pieces that evoke each other and speak for themselves at first sight, have always been noteworthy. However, what I find more interesting is conversions, refinements and disengagements a young artist can experience in his/her short period of life with producing. 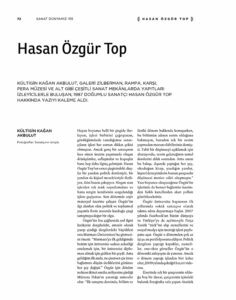 The streaks in Hasan Özgür Top’s art line get on with his political matters on one hand, and his personal issues on the other, yet the two sometimes collide with one another. He makes us flit from pieces that chant slogans to monochromatic abstractions, as well as pieces where colour itself is questioned. Özgür has been working on archival materials recently, and the line he has drawn between the political and social life and the form, both of which he is densely occupied with, is a concept worth discussing. 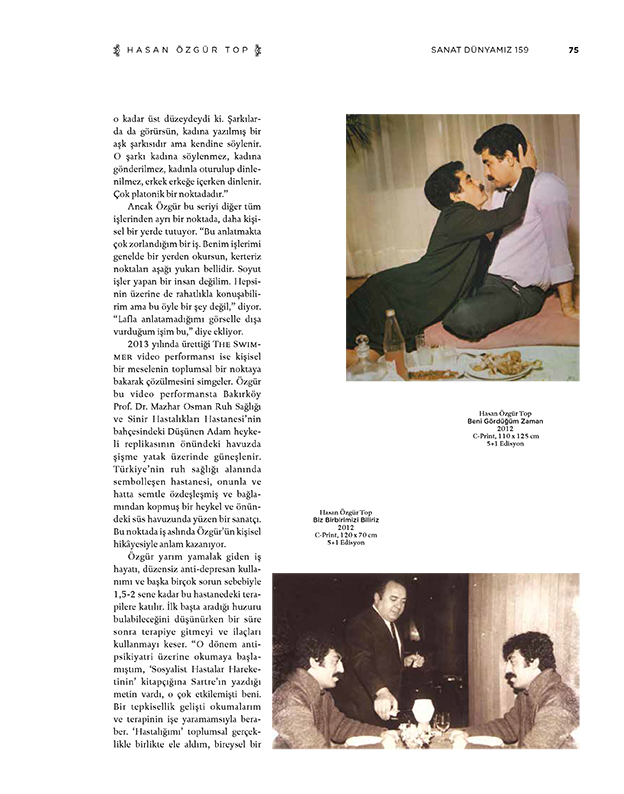 In his high school years, Özgür takes an eager interest in cartoons magazines, and his masters in those magazines where Özgür had also penned his works yet unprofessionally, suggest him to study in Marmara University. “When I attended Marmara, what going to a university meant to me was simply about suspending the military service and having a diploma. But everything in my mind changed right from the moment I started to study there, when I am given the vision to whatever I draw I get to consider its context in the first place.” The day Özgür walked into Mürteza Fidan’s workshop when he was a sophomore, and breathed the atmosphere she created has been the day standing as an important milestone in his career. “Once in her orientation class we had a discussion about the department and the academic year, and had pointed out that we were to make no account of the name Painting Department since we would well be graduated without practicing even one single painting. She definitely was overstating to construe an idea; later we had classes on art fundamentals with her. Yet her very attitude and idea was that everything you do in free world, books you read, papers you write and your personal experiences are a part of it, which has been motivational in all ways.” In this article, you will have a reading on Özgür’s works and see the paths that flow through different channels on the basis of similar contexts. In the early years in his university life, Özgür makes quite a nickname for himself as a street artist. As soon as Facebook goes worldwide along with Turkey in 2007, he starts to show up by the nickname Parça Tesirli (Cluster Effect) and opens to public share his stencils and works he produced for social media before. Now very few of his works from that period are available in Özgür’s portfolio. Magazine covers he made for political publications, stencils and one-shot images also reflect his attitude in that period. However, out of the works he produced then, one becomes persisting: Halay (an Anatolian folk dance) video he shot in 2009. There is a blank wall with one single frame on it; inside the frame there is a blurred picture of Atatürk dancing a Waltz. On with the waltz music, three men enter the video frame and dance a Halay in slow motion. “It has been the work I particularly like among those early works of mine, in fact I recount it in wonder how I could do it at that age,” Özgür defines his piece. “For this work I percept it as something with an intelligible space and a better use of material. In plastics aspect, there are a blank wall, a picture, three men and the waltz music. If it resembled those other works of mine, there would be slogans all through the wall,” he singles out the very characteristics of Halay from his other works. Considering the fact that the video is low-resolution, it takes us back to our practices on watching online videos back in those days as well. In that period, Özgür starts to produce a video compilation based on Counter-Manipulation. He explains the idea behind this compilation as “Back then the way I see the world was about the idea that the mainstream media keeps everything in dark and the world will change when we learn the truth. I was way obsessed with the truth then. So I was thinking like I could and would change it with those counter-manipulations.” In the video compilations, he produces a counter argument by editing various kinds of stock videos of newscasts, bank commercials and public office video bulletins. The compilation Özgür made with those stock videos becomes also a part of transition from social media to exhibitions for him. His works are exhibited in places such as Karşı Sanat and Depo, where political exhibitions are held. In 2012 Özgür prepares the compilation We Know Each Other. Those photo collages allow Özgür to move beyond social media and extend out to a much wider area. He participates in Mamut Art Project and gains an indelible impression on a good part of the mainstream media. The compilation involves stars from Arabesque world, who sit alone or drink Raki with himself or give a kiss or a hug to himself, and it draws a harsh reaction from Arabesques fans. On the other hand, some regard those works as a criticism against patriarchal system. His video performance The Swimmer he did in 2013 symbolizes finding a remedy to a personal problem from a social standpoint. In the video, Özgür sunbaths on a seabed in the pool in front of the replica of the sculpture “Le Penseur” in Bakırköy Prof. Dr. Mazhar Osman Mental Health and Neurological Diseases Hospital’s garden. There is the hospital standing as a symbol of mental health services in Turkey, the sculpture already lost its context and identified with that hospital and further with its quarters, and an artist swimming in a decorative pool in front of that sculpture. At this point, Özgür’s work actually makes a literal sense only with his personal story. Özgür attends therapies in that hospital for up to 1,5 – 2 years due to his chequered career, irrational use of anti-depressants and many other problems. At first, he thinks he may find the peace he is looking for this way but after a while he stops therapies and medication. “I started reading about antipsychiatry and there was this text written by Sartre in the Socialist Patients’ Collective manifest, I was impressed by it a lot. All those readings and therapies helped me for good and I could develop a sort of reactance. I considered my ‘illness’ together with its social reality, and it was an issue no longer individual.” The Swimmer is not only an expression of the reactance he developed against the hospital as an institution and the psychiatry, but is also a part of his own therapy. Özgür produces the video Nissan Jihad as his last work in the compilation based on Counter-Manipulation. He again develops a counter-statement between the commercials of the car brand, and the means used by jihadist organisations. That video also corresponds to the period when he turns his head to the Middle East. “Actually I had an interest in the Middle East before the wave of Arab Spring. We could see that in earlier periods, especially the radical left-wing groups in Western Europe had been to the Middle East for training purposes. And the continuity of this story caused me to take a look at it. They just go there but whom they join with. As a matter of fact, we belong to the generation of September 11th at one point. The sensation created by that resistance got our eyes on the Middle East.” Most of the works Özgür produced in line with that period are sensational. Özgür states that although he finds the word “sensational” very funny, he prefers to go for aggregation. His works start to be shared on Facebook, found newsworthy by non-artistic publications and mentioned in forums. Yet his productions gradually become pure. Özgür states that just like the parts of a rocket are consistently dropped after it is launched to the moon, he starts to take a weight off his mind. In his work From Guantanamo to Raqqah, Özgür puts forward an idea out of a colour that also bears a meaning from the Middle East. He adopts this idea through orange jumpsuits, which prisoners wear in Guantanamo Bay detention camp. Prisoners in Guantanamo consist mostly of high-profile people in jihadist terror organisations. In retaliation for that, jihadist prisoners also make the people they kidnapped wear orange jumpsuits. The US journalist James Foley, for example, is executed in an orange overall. At this point, Özgür comes up with a work based on the colour orange in two mutually exclusive instances. “Well they are not the same colour, they are two different shades of orange. I picked up one of the colours with dropper from the orange overall the US journalist wears and put it on the bottom part of the image, and the other one from the orange jumpsuits in Guantanamo and put it on the upper part, and integrated these two shades of orange. It was interesting for me to have the same colour connect at different points.” Ironically, another jihadist organisation fighting with the IS prefer to wear orange jumpsuits themselves while executing the people they kidnapped. 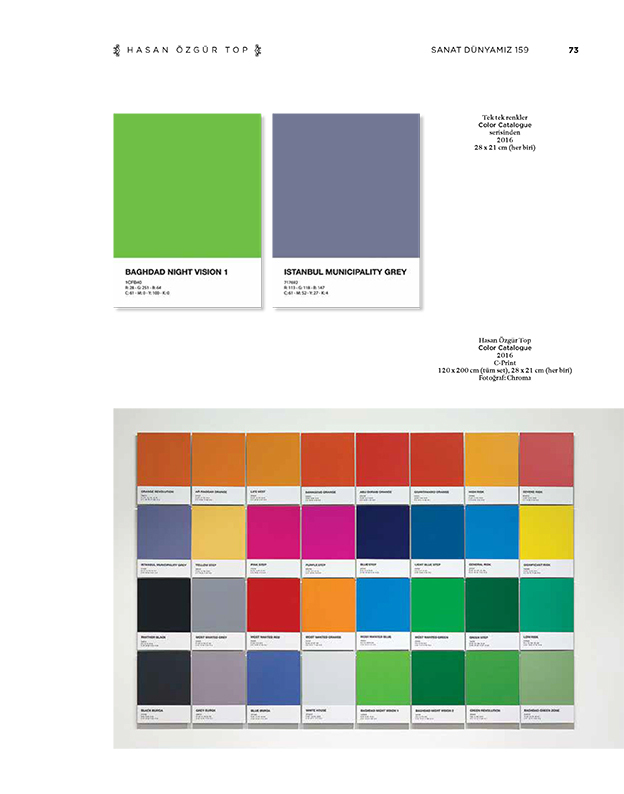 Özgür addresses the question “How are today’s political discourses constituted through colours?” Besides, this work refrains from firm discourses as well. Apart from basic discourses such as “violence everywhere, violence creates violence”, this work is a search for some new discourses. 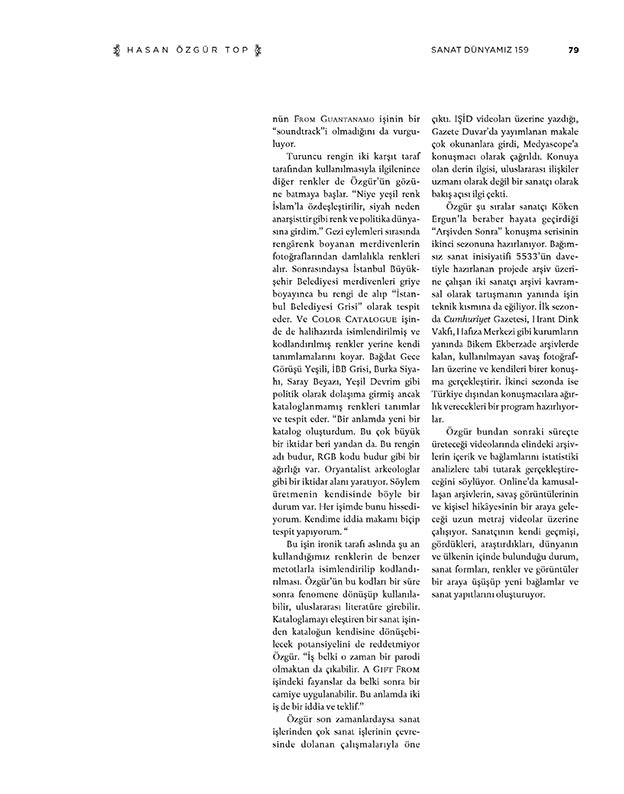 Özgür sketches out his search for discourse and form as follows: In my early works, there is this mood and language of confidence that has determined all the rights and wrongs in the world. But I gradually start producing more indeterminate works. I am so much in an indefinite position so that I deliver a language even questioning the colour, which is one of the most fundamental concerns of the discipline I attend to. My earlier works have confidence; they are perfectly content. However, these works of mine try to express themselves with a very few words, question where they exist and ascribe to uncertainty. Another work where Özgür deals with both Guantanamo and the colour orange is the album Torture. He makes an album from the songs and voices played in order to torture prisoners in Guantanamo, and publishes 100 copies of it. Özgür states, “It can be discerned as a found-art somehow, and it also went through editing since it is composed of selected songs,” but he emphasizes that Torture is not the soundtrack album of From Guantanamo to Raqqah. 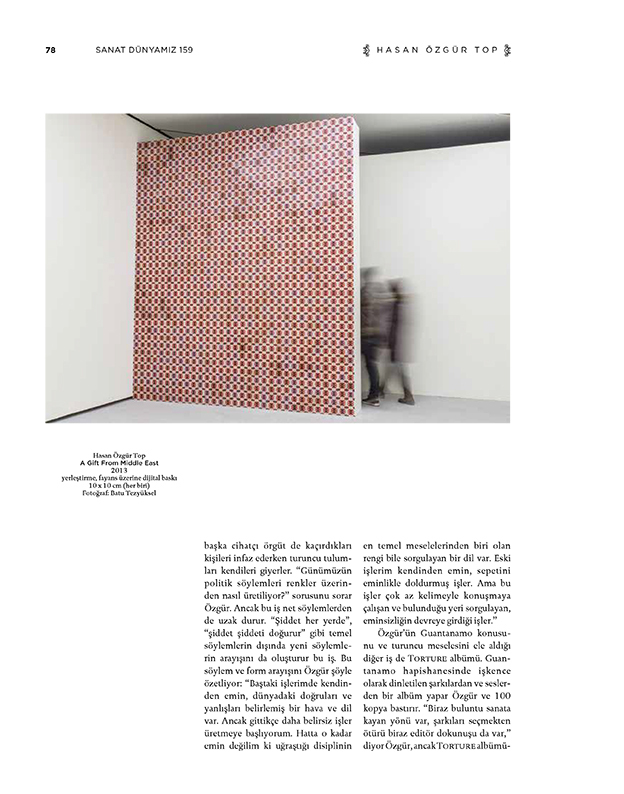 In recent times, Özgür presented himself in a field wheeling around artworks rather than his own produce of art. 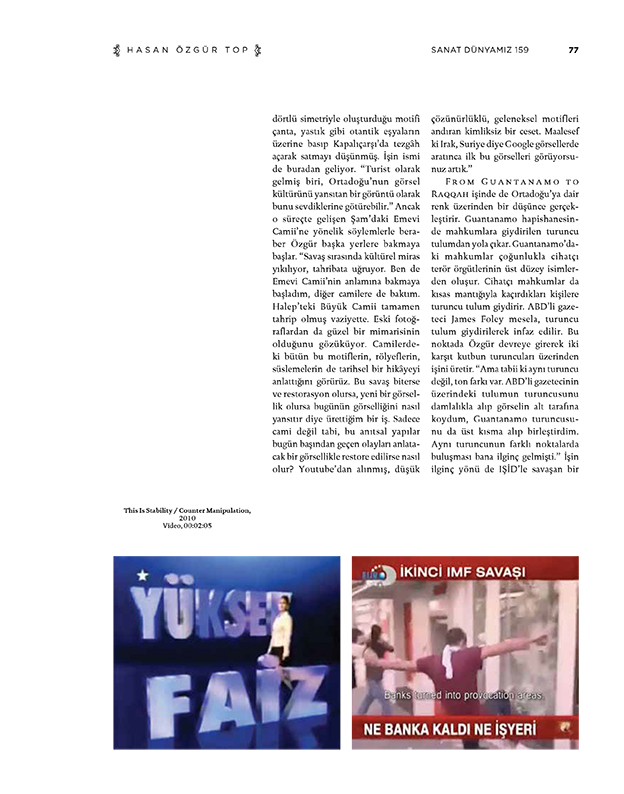 The article he wrote on the IS videos was published in Gazete Duvar and listed in the most read articles. He was invited to Medyascope as a guest talker. He drew attention with his deep interest in the subject, and his perspective not as an international relations expert but as an artist. Özgür recently is laying the groundwork for the second season of the talk series After The Archive?, which he carries out with the artist Köken Ergun. In the project prepared by the invitation of independent art initiative 5533, two artists that work on archiving will address technical specifications of archiving together with discussions about archive as a concept. In the first season, Hasan Özgür Top, Köken Ergun and Bikem Ekberzade talked on war photos kept in the archive and not used anymore, along with institutions such as Cumhuriyet Newspaper, Hrant Dink Foundation and Memory Centre. For the second season, they prepare a program that will give priority to talkers from outside Turkey. Özgür states that for the following period, he plans to produce videos by statistically analysing the contents and contexts of the archives he has. He is working on feature-length videos where archives that became public on the internet, war pictures and his personal story will come together. The artist’s personal background, what he perceived so far, his researches, situation the world and the country in, art forms, colours and images get intermixed and create new contexts and artworks.